Please contact us if you find errors or have problems with the data or with this web site. 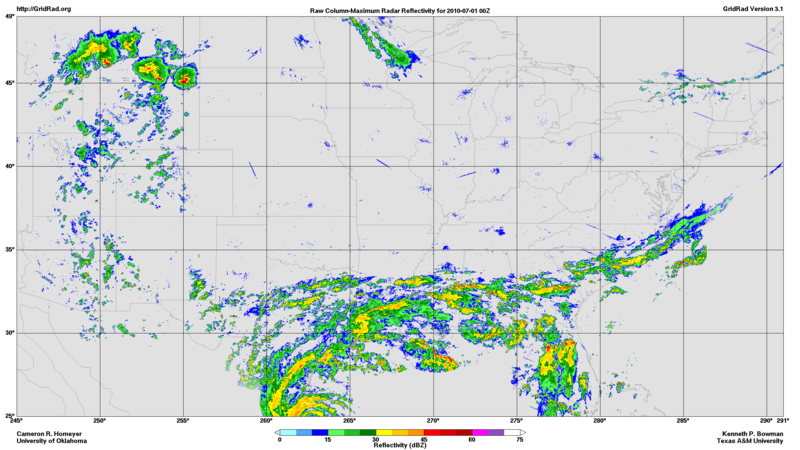 As part of a National Science Foundation funded project to investigate the effects of deep convection on the stratosphere, the authors have merged radar reflectivity data from 125 National Weather Service NEXRAD WSR-88D weather radars to produce hourly, three-dimensional, high-resolution analyses of radar reflectivity that cover most of the contiguous U.S. The gridded radar data, known as GridRad, currently covers the period 1995 through 2016. In the future we plan to analyze additional years, include additional radars and variables, and increase the frequency of the analyses. The original NEXRAD Level 2 data (volume scans) from individual radar sites were obtained from the NOAA National Centers for Environmental Information (formerly NCDC) and from Amazon Web Services and Google cloud storage systems. The Level 2 data for this time period are approximately 270 TB (compressed). The NEXRAD Level 2 data from multiple radar sites have been merged and gridded to a regular, high-resolution (0.02° x 0.02° x 1 km), three-dimensional, longitude-latitude-altitude, Cartesian grid using software developed by Cameron Homeyer. Analyses are available at hourly synoptic times (00Z, 01Z, ..., 23Z). The GridRad V3.1 files for 1995-2016 require ~4 TB of storage. Click here for information on how to obtain the GridRad data from the NCAR Research Data Archive. Information about the methods used to create the gridded reflectivity fields, along with details of the data file contents, can be found in the GridRad Version 3.1 Algorithm Description document. For further information, contact the authors through the links above. The radar data used to create the GridRad analyses were collected by the U.S. NEXRAD WSR-88D radar network, which is operated by the National Weather Service, an agency of the National Oceanic and Atmospheric Administration within the Department of Commerce. The NEXRAD data were obtained from the NOAA National Centers for Environmental Information (formerly NCDC) and from Amazon Web Services. Creation of this data set was funded by National Science Foundation grants AGS-1522906 to Texas A&M University and AGS-1522910 to the University of Oklahoma: Collaborative Research: Observational and Modeling Studies of Overshooting Convection and Stratosphere-Troposphere Exchange. Additional support was provided to Kenneth Bowman by the David Bullock Harris Professorship in the College of Geosciences at Texas A&M University. Thanks to the NCAR Research Data Archive for hosting the GridRad data. The authors thank David Solomon, John Cooney, Tyler Fenske, and Synclaire Truesdale for their contributions to many stages of the creation of the GridRad data.